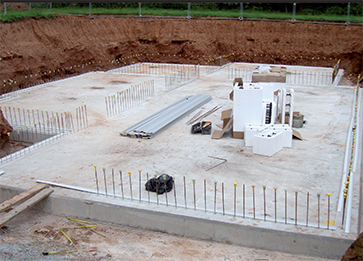 Triton has supplied systems to waterproof the basement of a large new build dwelling in the South West. TT Super Admix was added to the concrete mix for the base slab and the insulated concrete formwork infill, to provide a Type B waterproofing system as defined by BS 8102 2009. TT Super Admix is a unique chemical treatment for the waterproofing and protection of concrete – designed to be used as an admix at the time of batching. The active chemicals react with fresh concrete to generate a non-soluble crystalline formation which seals the concrete itself against the penetration of water or liquid, and protecting it from the deterioration effect of harsh environmental conditions. Triton Fillet Seal was applied to ensure a smooth transition between the wall/slab joint at the exterior base of the ICF. Fillet Seal is a pre-packed, cement based and polymer modified product which is designed for use as a floor/wall junction seal and minimises the risk of leaving gaps or holes unsealed during the waterproofing works. Three coats of TT Vapour Membrane were then spray applied to the exterior of the ICF formwork as the primary waterproofing layer. TT Vapour Membrane is a ready blended, elastomeric coating which provides a waterproof barrier which provides Type A waterproofing as defined by BS 8102 2008. A highly versatile product which can be used for waterproofing as well as a ground gas barrier on floors, TT Vapour Membrane is very fast drying and easy to apply. To complete the waterproofing system, Platon Double Drain cavity drain membrane was fixed to the exterior formwork wall to protect the underlying TT Vapour Membrane layer from any backfill damage. Double Drain comprises a filter fabric layer which ensures soil cannot enter the membrane cavities to impede drainage and is installed with the filter fabric facing the backfill. ICF TECH Ltd installed all elements of the waterproofing system with each stage being inspected by Triton’s technical team to ensure the application was in accordance with their requirements.